DETROIT - The 2007 North American International Auto Show, one of the world's premier automotive events opening its doors in Detroit next week, will not just be about the best of the best new cars and future concepts. At the Saab stand, the public will be able to meet a shining example of longevity and durability: the 1989 Saab 900 SPG that recently passed the one million mile mark in the hands of Wisconsin insurance salesman Peter Gilbert. Saab Automobile USA announced last month that it will offer a free new Saab to any U.S. customer who covers the distance of one million miles (or more) in a Saab that he or she originally purchased new. The new Saab will come with the 100,000 mile/5 years GM Powertrain warranty and 3 years/36,000 miles free scheduled maintenance, standard with every model in the 2007 Saab Automobile USA portfolio. 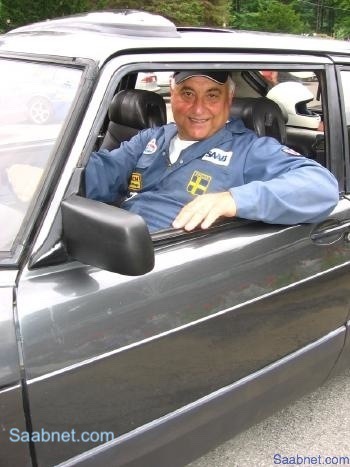 "Saabs are made for people who love to drive, as proven by the many high-mileage examples in the Saab owners' community", Spenchian said. "Having personally been with Peter Gilbert in his 900 SPG as we crossed their magical finish line together, one cannot help but being impressed by the condition of car and driver after one million miles. Our offer of a new Saab to any U.S. customer who equals this achievement, should be seen as a token of appreciation for the enduring loyalty and confidence in Saab." Mr. Gilbert will receive a brand new, 260 hp Saab 9-5 Aero SportCombi (MSRP $38,735) as a worthy replacement for his tried-and-true 900 SPG. Delivery of the new car is to be scheduled in early 2007 at the Saab Aero Academy at Road Atlanta, Georgia. Saab is the only U.S. manufacturer offering this two-day enhanced driving course - a $1,350 value - at no cost to every U.S. customer who buys a new Saab 9-3 Aero or 9-5 Aero. "I am obviously thrilled with the idea of being presented with a new Saab 9-5 Aero", Gilbert said. "It is not just fast and fuel efficient, but also extremely safe. A reassuring thought, keeping in mind that my faithful 900 SPG and I survived many a collision with Wisconsin deer. Who knows, I might take a run at another million miles in my new 9-5!" The offer of a free, new 2007 Saab 9-5 Aero [not to exceed an Manufacturers Suggested Retail Price of $38,735 (certain features and options are subject to availability at time of delivery) and delivery to take place at an authorized Saab USA dealer] valid from the date of this release through calendar year 2007 (offer ends Dec. 31, 11:59 p.m. Eastern Time), is available to any U.S. customer who can present verifiable proof to Saab Automobile USA that he or she is the original owner of the Saab vehicle that covered one million road miles or more, that the vehicle is in running condition, that the odometer hasn't been tampered with, and that the vehicle is currently and has always been registered in the United States. The customer is responsible for all applicable taxes, title fees, registration and destination charges. Visit www.saabusa.com for important details and limitations on this offer.